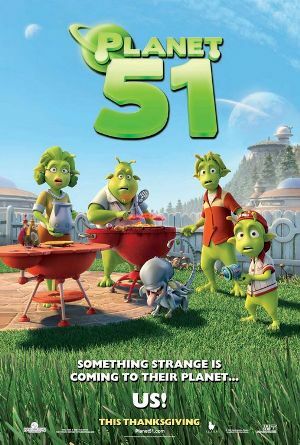 Genre: Animated, Comedy; Theater release: November 20, 2009 by TriStar/Sony Pictures; Directed by: Jorge Blanco; Runtime: 1 hour 31 minutes; Cast: Justin Long (Lem), Dwayne Johnson (Captain Charles T. Baker), Seann William Scott (Skiff), Jessica Biel (Neera), Gary Oldman (General Grawl), John Cleese (Professor Kipple). An alien from space lands on the planet and the folks respond fear, the military searches for the intruder, and the scientists want to study it. Meanwhile, the alien makes friends with the kids who try to help him get back home. You have seen this scenario a dozen times before in E.T. and a bunch of assorted Sci Fi and Disney movies. Nothing really new here except the alien is an American astronaut from Earth.